An in-depth look at Indoor Air Quality in schools and the effects of indoor air pollutants on children’s overall health, asthma rates and academic performance. Commitment to student safety is at an all-time high, but despite valiant efforts, many schools are unable to protect their students from everyday dangers, namely environmental hazards. Over 50 million children in elementary and secondary schools are exposed to environmental hazards every day at school. These hazards can affect students’ short- and long-term health, as well as their ability to learn and perform in school. 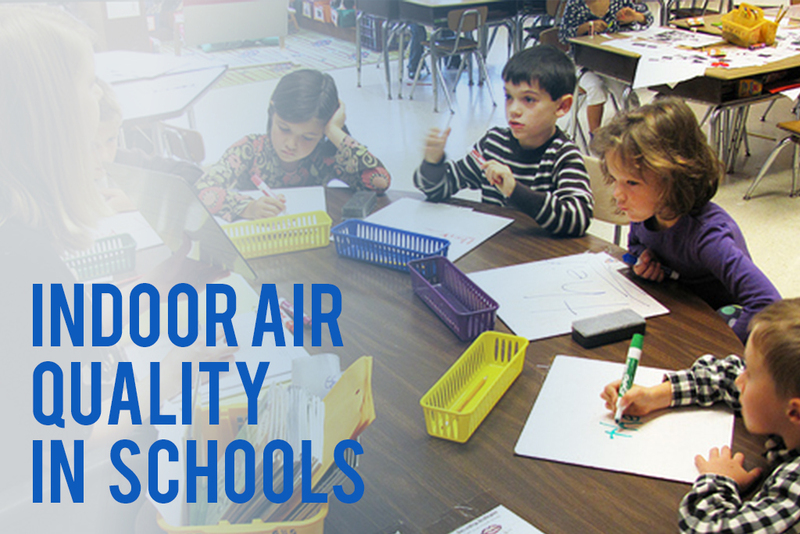 The most widespread environmental concern in schools is poor Indoor Air Quality (IAQ). While every school has its own set of environmental risk factors, IAQ and indoor air pollutants are factors that must be monitored and controlled in every school across the nation. Children spend dozens of hours in school every week, so the quality of indoor air in their classrooms can have a marked impact on their health and academic performance. Unfortunately, risks associated with indoor air pollution are twofold for children. First, children’s lungs are exposed to more air in any given time period because they breathe at a faster rate than adults. Second, children’s lungs are smaller and less developed than adults’ so they are more likely to experience complications from exposure to indoor air pollutants. When it comes to students’ health, poor IAQ can have both temporary and long-term effects. In the short-term, exposure to indoor air pollutants every day at school can lead to temporary health issues like eye, nose and throat irritation; fatigue; and headaches, or to more serious health problems, like asthma. Regular exposure to some contaminants has also been found to cause serious long-term health problems, including cancer and damage to the liver, kidneys, and respiratory and nervous systems, among others. Indoor air pollutants pose some of the greatest risks to children who suffer from asthma. According to the Centers for Disease Control and Prevention, almost seven million children in the United States suffer from asthma, with more children being diagnosed every day. It is also the third leading cause of hospitalization among children under 15 and the leading cause of absenteeism from school due to a chronic illness. Many asthma triggers include the airborne environmental pollutants that children are exposed to every day in school including mold, ozone, and other indoor air contaminants. Some pollutants, like ozone, have even been linked to causing asthma in children. Why is Monitoring IAQ So Important? IAQ problems can be elusive because the environmental hazards that cause them are hard to detect. Oftentimes, schools do not know there is an IAQ problem until students or faculty are experiencing symptoms and environmental causes are investigated. This means that when it comes to protecting students from indoor air pollutants, being proactive is key. Mold spores can be found nearly everywhere in our environment, and in the presence of moisture they only need one or two days to grow. It follows that the key to avoiding mold growth in schools is preventing moisture in the first place. Common causes of moisture problems include poor drainage; misdirected sprinklers; flooding; and leaky roofs, pipes, windows, foundations and other structural openings. Moisture problems can also occur due to poor ventilation during regular maintenance, or when air-conditioning and heating are reduced during school breaks. Health effects and symptoms associated with mold growth in schools include allergic reactions, asthma, respiratory irritation, fatigue, diarrhea and nausea. Then mold is present, students and faculty with pre-existing allergies and asthma are oftentimes the first to complain. Radon, a naturally occurring radioactive gas, is currently the second leading cause of lung cancer in the United States (after smoking). It is created during the breakdown of uranium in the soil and enters buildings through cracks and holes in the basement walls, floors and foundations of buildings. According to the Environmental Protection Agency (EPA), more than 70,000 schoolrooms nationwide have elevated radon levels at least some of the time. Unfortunately, because it is colorless and odorless, radon gas is undetectable unless a radon test is conducted. All schools are encouraged to test for radon since it is among the most serious environmental hazards found in schools. Many products used in schools contain harmful organic vapors or volatile organic compounds (VOCs). Some of these products include paint and paint strippers, wood preservatives, cleansers, aerosol sprays, air fresheners, and craft supplies. The VOC risk level varies from product to product, but in general, exposure to VOCs is associated with eye, nose and throat irritation. More serious, long-term health effects associated with VOCs include cancer and damage to the liver, kidneys and central nervous system. Schools can reduce the presence of VOCs on their campuses by using environmentally friendly products and alternatives with lower VOC levels. When schools must use VOC-containing products, it is important that they safely store and dispose of the products and ventilate work areas when appropriate. Heating, Ventilation and Air-Conditioning (HVAC) systems can either greatly help or hurt a school’s IAQ situation. Efficient HVAC systems are designed to keep the temperature, humidity and air pollutants in a space at safe and comfortable levels. If the HVAC system is outdated or not working properly, the quality of indoor air can deteriorate quickly. Uncomfortable temperatures in the classroom can make it difficult for students to concentrate and perform. Furthermore, buildup of airborne irritants and pollutants can trigger students’ allergies and asthma, or cause other respiratory symptoms. This is the second installation in a series of articles AMI Environmental will be publishing on environmental hazards in schools. Keep a look out for our next Tech Bulletin, which will take an in-depth look at Toxic Hazards in Schools, where they can be found, and the risks they pose to children’s health.